This painting by Dale Shuttleworth of Alberta, Canada, depicts a community of twelfth-century monks gathered around their abbot who holds a crosier, symbolic of his office. Their undyed, whitish robes suggest the several reform orders of the late eleventh and twelfth century, most notably, the Cistercians and Carthusians, who succeeded the black-robed Cluniac Benedictines as leaders of monastic reform. For all the centuries of the Middle Ages and later, monks and nuns sought to create communities on earth that reflected the love and beauty of the eternal city of God. In the course of this quest, they left a legacy for Christian society in modern times. With the publication of this sixth volume, we complete Part I and reach the halfway point in the twelve-volume series. We have now covered the first Christian millennium and moved slightly into the second, ending on the eve of the Crusades. This volume covers what will probably turn out to be the longest time span of any of them, the period from 740 to 1100–three hundred and sixty years in which four momentous developments take place. The first is the most difficult for the modern reader to comprehend. The monk and the nun become the central figures of Christianity. The idea of giving up home, family life, all one’s possessions, almost all physical comforts, and all of one’s time, to the service of Jesus Christ, in common with other men or women of similar mind, will seem to many readers extreme to the point of delirium. And yet, is it? Christians today of almost every denomination give up many of these things when they undertake foreign mission work. Others do so in undertaking work in urban ghettos. At a minimum, every Christian risks being branded a “religious kook” if he witnesses to Christ in a typical workplace. And there was a time, in the memory of many people still living, when men voluntarily gave up these same things to fight in wars from which there was every possibility they would not return. No, the depth of the commitment of the monk or nun is not entirely unknown today. Only the form of it is unusual. But in these centuries long passed, it was not unusual. Impelled by their vision of a world to come, men and women divorced themselves from this world. Ironically, however, their effect on this one was profound and is still with us today, for they established the very foundations of our society. That is the first development covered in this volume. The second is a great tragedy. Eastern and Western Christianity divided, to the ultimate detriment of both. Neither wanted this to happen. When it did, neither believed the rupture would be permanent. But it would become permanent, and in no small degree because of it, in Part II of the series, we will see Eastern Christians suffer almost an entire millennium of steady oppression and persecution, unrelieved and on occasion made worse by their brothers in the West. Offsetting this reversal, however, is the third development, a truly glorious accomplishment, namely the thorough conversion of the Slavic peoples and the establishment of Christianity right across Eastern Europe. The delightful story of its crowning achievement, the coming of “the Rus” to Christ in Prince Vladimir’s determination to win his Christian wife, is one of those strange love stories that happen also to be true. It concludes chapter 8. Finally, we come to the fourth event, or series of events, of which Christians should be acutely aware. Much mention is made these days of the Crusades, which are usually portrayed as an unprovoked Christian attack on the peace-loving peoples of Islam. This is greatly at odds with the facts. In the last volume, we showed how Islamic forces took over more than half the Christian world at the point of the sword. In the last two chapters of this one, we show how Muslims fought for the next three hundred years to finish off Christianity, conquering southern France, Sicily, Crete, the Aegean Islands and repeatedly attacking Rome itself, resulting finally in the Christian counterattack known as the Crusades. From the Christian perspective, the Crusades were morally doubtful. But they were not unprovoked. They were very provoked indeed. To read any of the stories contained in Volume Six of The Christians, Their First Two Thousand Years click on its title on the menu to the right. 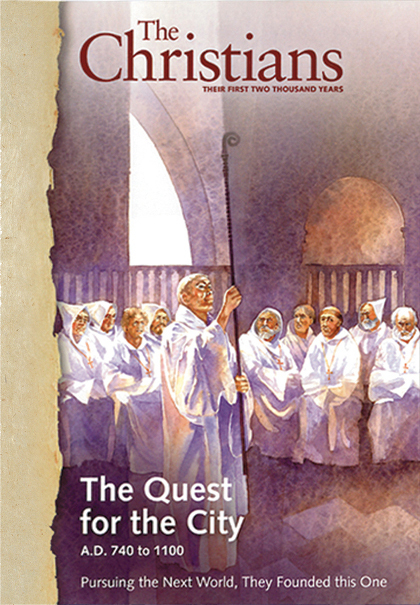 If you prefer to experience the stories beautifully laid out in print with hundreds of magnificent illustrations of the period then we encourage you to support this project by ordering the book from The Christians website.